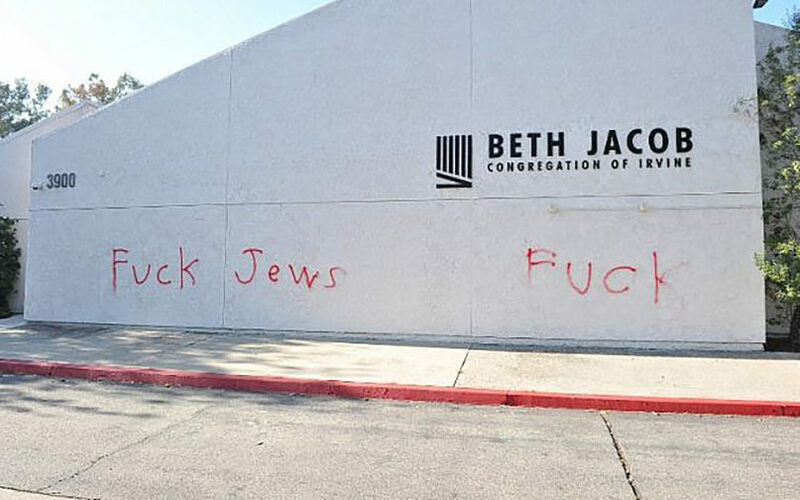 By Dan Lavie and Israel Hayom Staff (JNS) Antisemitism reared its head again last week when the Beit Yaakov synagogue in Irvine, Calif., was vandalized with antisemitic graffiti overnight on Tuesday, Oct. 30, just three days after a shooting massacre at Tree of Life Or L’Simcha Synagogue in Pittsburgh. The suspect was captured on video and police in Irvine were investigating the incident. Meanwhile, a political event scheduled for Thursday night, Nov. 1, at the historic Union Temple synagogue in Brooklyn Heights was canceled after antisemitic epithets that included “die Jew rats we are here,” “Jews better be ready” and “Hitler” were scrawled on the premises. The police announced on Friday night that they had arrested James Polite, 26, on charges that he spray-painted the antisemitic graffiti. He faces charges of criminal mischief, which the police classified as a hate crime, and making graffiti. Polite has Jewish foster parents and was an intern for former City Council Speaker Christine Quinn, for whom he worked on initiatives to combat hate crime. He was also a volunteer on former U.S. President Barack Obama’s first presidential campaign. He was taken to a hospital in Brooklyn for a psychiatric evaluation. Police said on Saturday that Polite had also recently set a string of fires, including in the closet of Yeshiva Beth Hillel in Williamsburg, and smaller blazes in the trash receptacles outside three other nearby Jewish institutions, the New York Post reported. In 2017, Polite was the subject of a New York Times profile, in which he was described as gay and bipolar. CAP: Anti-Semitic graffiti is written on the Beth Jacob Congregation of Irvine on October 31.